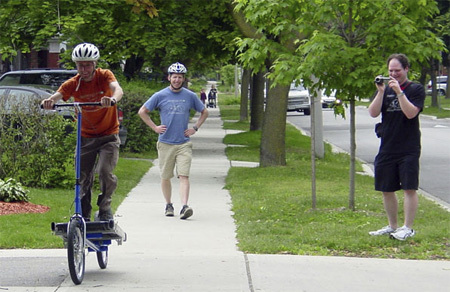 Treadmill Bike is an innovative fitness device that promises to revolutionize urban transportation. Treadmill on wheels offers the same fat burning benefits as a conventional treadmill without the expensive gym membership fees. Neat concept. Although, I cannot help to think it’s somewhat contradictory of itself. Wonder if the track would speed up when you are going downhill? That’s the most ridiculous thing I’ve ever seen in my life. If you want to walk – do it. If you want to ride a bike – do that. This invention just makes both biking AND treadmilling worse!!! It’s really ridiculous! Besides, how would you balance yourself in only 2 wheels while running over that?! Stupid and badly thought project! Wow. It’s almost like walking for real! Yeah, I can save a gym membership. But I could buy both a treadmill AND a bike for less then the cost of this thing. $2500.00 Canadian Dollars for this rubbish. Why don’t you just….run to where you need to go? Has to be a joke. Watch the video, they’re all laughin! @Julie you have a great point as I didn’t watch the video my first time around, glancing through the post. I agree, this has to be a joke! Ok it’s healthy, but only because you have to put in MORE effort for LESS speed, bit of a step back isn’t it? How ARE they balancing themselves?! Though its an interesting design, i don’t think it’ll get made for the obvious reason that most people either run or bike and not at the same time. i’m more interested in the treadmill/pc where you walk while doing stuff on the pc. I sure hope this isn’t real because that has to be the most ridiculous device i’ve seen. Walk, run or bike. You don,t need anything fancy or pricey. Heck do some kind of other sport you actually like. And what’s with the spinning rims? C’mon, it’s a joke! Get it? I don’t see any revolutionary thing in this thing! Couldn’t you just go for a jog? Wow, I’ve never seen a joke go whooshing over so many people’s heads at once like this. or u could just run outside, dumbest idea ever! Not only is the video clearly a joke, but if you’ll notice, the treadmill doesn’t even connect with the wheels. Their movement is purely based on the trajectory of their initial push, as the treadmill itself provides no propulsion to the bike. Although completely unsafe and impractical, given the right area with which to use this, I’ll bet it would be pretty fun to toy around with. This is sadly not a joke they do sell for $2,500 Canadian. Google bicycle forest if you want to see their website. Why use this if you can just walk or run? Also, this causes unnatural movements and can damage your spine. Unfortunately, nice try, but bad concept for real. I’m going to run out and get one right now….or maybe I should ride my bike to get one…..ohhhh I’m so confused. I wish I had one now so I wouldn’t have to decide which way to go out. lame idea, if you ask me. Why not just run on the ground? Usually, the “concepts” are cool and futuristic, but this one is pretty lame. I don’t understand how is it better than the conventional bicycle? this is even cooler than a t-shirt with wolfs on it. even more universal chick magnet and the key to anyone’s personal development and success. 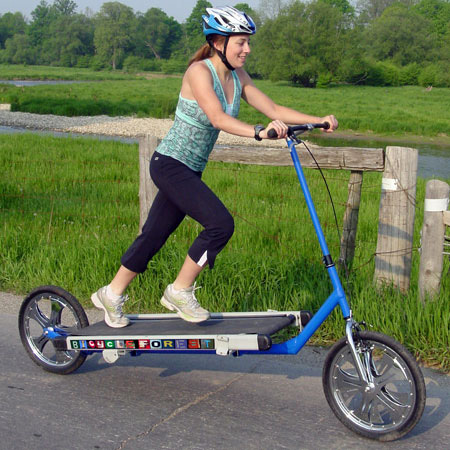 after seeing the happy faces of the people using the treadmill bike, I now realize what the real and right way of urban transportation is. from safety to convenience – this is the ultimate solution! WTF? I hope this is some sort of joke. This is definitely a joke. If you can’t tell that the track isn’t even what’s moving the bike, then you need better perception. This is F’n stupid as hell. If it had gears it might possibly have an advantage over walking. A saddle would also be good, and perhaps a redesign of the transmission to make it more efficient. It’s a joke, right? Ha. Why do people waste time & money just to come up with such rubbish! Out! I thnk it needs so much power. Seriously? If you want to get out on wheels, ride a f*/#ing bike! Jeez, people. I really like this one!!! How do these ppl come up with these things??!! This is by far the stupidest thing i’ve seen in a while. I saw one of these given away on Wheel of Fortune! Until then, I thought it was a joke! 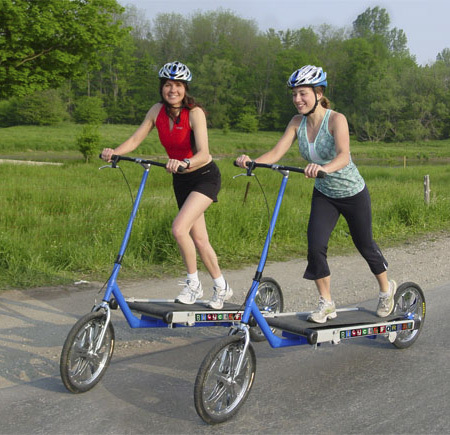 Are you tired of using your legs to move “efficiently”… pst… Now you can do it with a conveniently huge device that will make things like stairs, rough terrain, bus rides, subway use, elevators and crowds a new and totally unnecessary challenge! This is a great example of some clever folk who applied their skills to a problem that didn’t exist. 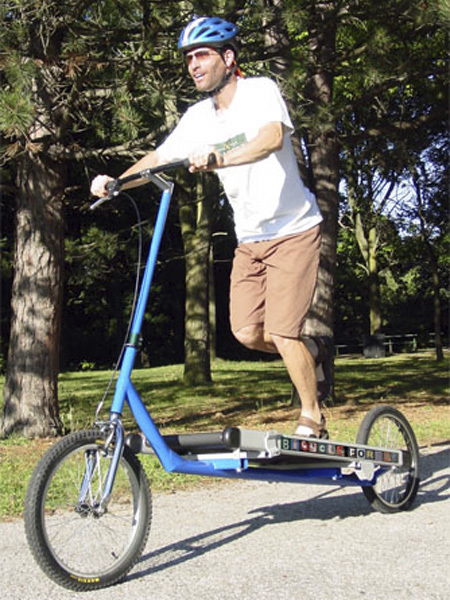 Just curious if my insurance would cover the beatings I would get for actually riding this silly thing. Talk about embarrassing! Is this an SNL commercial? This is the “silly–of-the-year” product. Come on – import something ‘else’ from China to try to make your million dollars. This won’t work. The people seem out of breath as they ‘run’ on the treadmill just to get the thing to balance. And on the downhill??? I see a Benny-Hill thing going on there….